An account of our second journey with Village Juicery, evolving our initial web design and branding for Toronto’s first certified organic juice bar and how we expanded the handcrafted brand through various product and print design stages. Parachute Design has been the Toronto web design company of record with Village Juicery since their inception. Our second time joining forces entailed a more educated and experience-based approach to the redesign of their website that we initially helped create when the company launched in 2014. From our first sit down with founders Tyler and Omar, we knew this relationship had all the right pieces to not only create some beautiful design together but also to establish a creative working relationship that would allow everyone involved to take ownership of the brand we all set out to create and shape from our initial strategy sessions. Now with four Toronto-based stores and online partners to boot, seeing the brand mix with lines of thirsty customers in organic juice bars around Toronto and the GTA is pretty fantastic. Our approach to web design for startups is simple and straightforward. Work with the logo design is often the starting point in the development of the visual identity, as it will serve as the cornerstone for the developing brand and everything that will follow, whether it be the website design, packaging, or signage. In this particular project we knew that we were dealing with an aggressive, but reasonable three-month timeline in order to go from initial strategy to official launch. In order to have all the different design components we were tasked with creating neatly polished and ready for initial launch, and to also ensure we were able to share the individual brand materials with other design professionals working on the interior layout of the flagship store and distribution chain, we needed to take a staggered approach to such a large undertaking once the logo design was completed. Through our discovery and brand strategy exercise with Village Juicery, we quickly created and refined the vision and key messaging for the new brand. From this, we developed the new logo design that would eventually fuel the website design, bottle design, and other major Village Juicery marketing materials to follow. Working together with Village Juicery and their interior design firm, we collectively moved forward with a unified brand design. We established a central colour palette, typographic style, and mood that would be applied both to our work on the website and packaging, as well as the flagship and subsequent store interiors, helping to marry all elements and customer experiences associated with the brand under the same umbrella. One of the most important pieces of the growing Village Juicery brand was the bottle, and later, jar design. The vessel’s purpose is not only to simply serve as a container to store and transport the organic juice and food from the store to the consumer. It also had to instil an emotion in the customer quickly and effortlessly. The bottle and jar had to be unique, signify the high-end premium offering, and not overpower or compete with the beauty of the product itself. Using the Boston Round bottle design got us started on this path and contributed to the uniqueness of the product within the Toronto juice and health food industry. In an effort to let the product do the talking, the decision was made to print the beautiful minimalist label design directly on the glass bottle, in contrast to the pure, vibrant hues of the juice and food product, establishing the foundation for a simple, healthy, premium product. To further support the foundation of the brand and signify endless pursuit of knowledge, the back of the organic juice bottle was designed to include icon-based nutritional information for each product, and a witty write up that not only educates the consumer about the health benefits of each ingredient but also includes some of the unique personality that lives within the brand itself. Shortly after the initial bottle designs were completed and tested, we created a series of roll-up banners to be used at trade shows and industry events for the Village Juicery team to begin marketing the product, and begin nurturing their brand awareness in the city. It was at one of these early pre-launch events that we heard of the success of the bottle design for the first time. After passing out samples to passers-by, they found that people were so in love with the bottle design that they opted not to return the bottles for recycling, but instead chose to keep them for themselves. At this point, we knew we had a winner as we pushed forward with the company’s new, responsive website design. Throughout the initial website design for startups project in 2014, the focus and goals for the website shifted often and considerably – all to be expected with any startup. 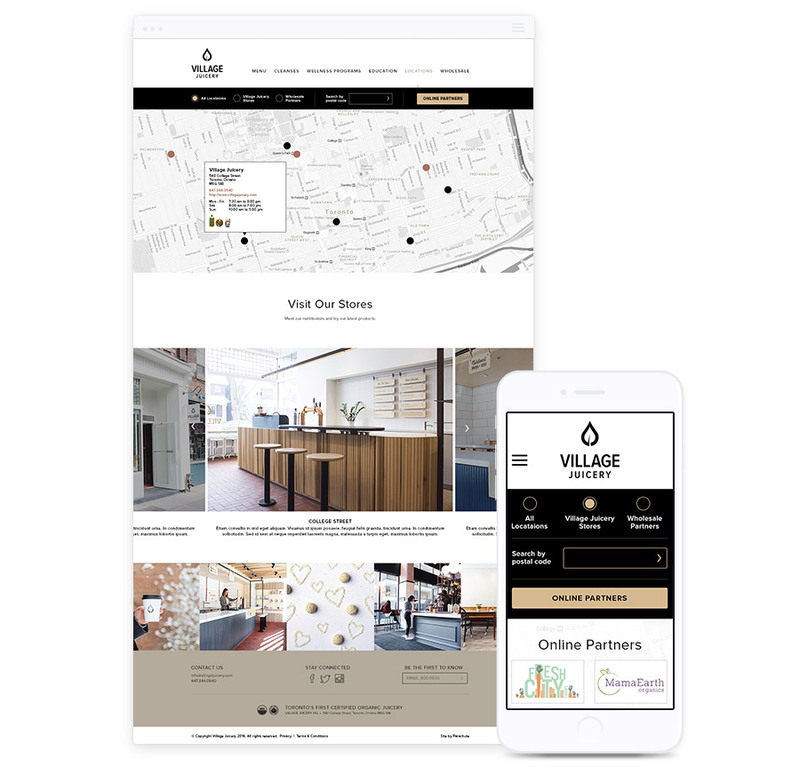 Ultimately, we were able to work very closely with the Village Juicery team to go to market with a stunning, hand-made, responsive website design that communicated the early messaging. 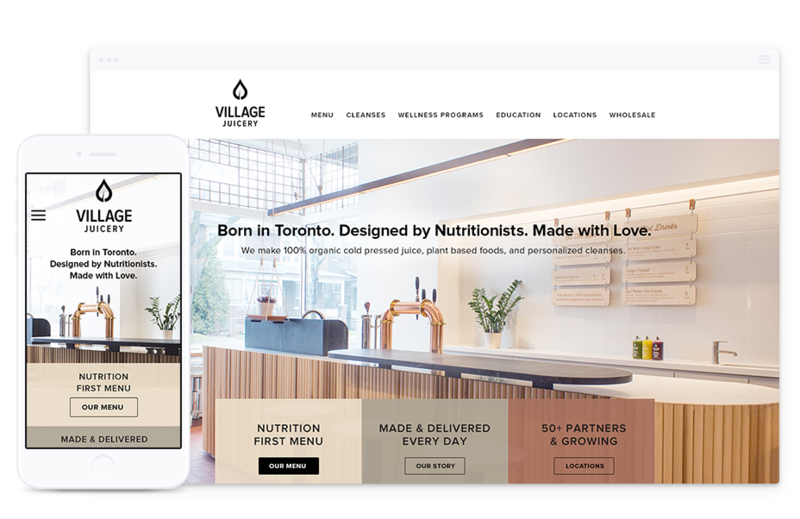 In 2016 the Village Juicery team came to our Toronto web design company with a much more rigid and educated approach to not only evolving the website design but also refining and reinforcing their now established brand and colour scheme. Key goals for the website were concrete and results-driven, while the new interface was to more closely align with the brick-and-mortar shop experience and feature only custom-shot, in-house photographs. 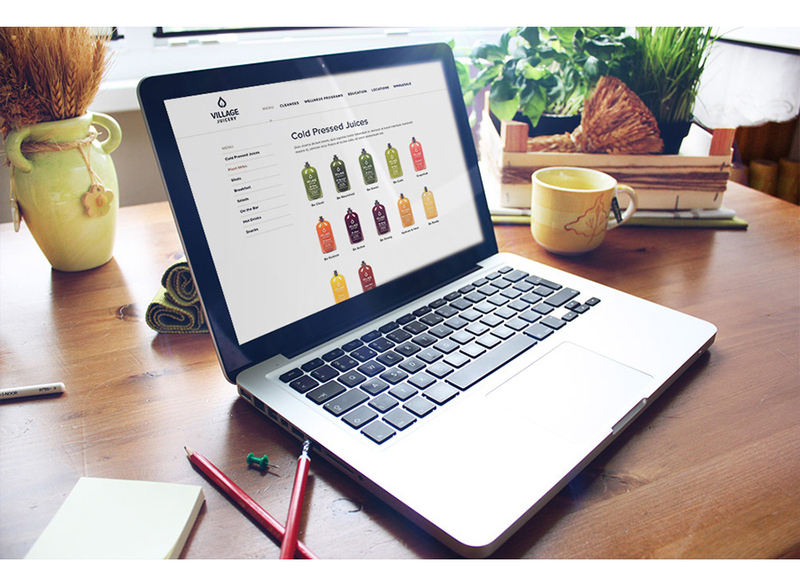 The newly launched Village Juicery website offers not just a presentation of product, but a unique educational experience for visitors interested in organic, cold-pressed juice and health food through the re-imagined blog, now aptly named “Education”. The organic juice bar website also features a dynamic store locator integrated with a custom-styled Google Map, from which customers can locate the nearest store or retail partner in Toronto (and around the GTA) to purchase their very own bottle of fresh, 100% organic cold-pressed juice. A new feature integrated into the offerings by the Village Juicery website is the option to book a consultation with a nutritionist at a Village Juicery store. Through the use of a third party scheduling application integrated into the responsive website design, users can book an appointment at a time and location of their choosing to discuss nutrition and cleanses with a qualified professional. As the organic juice bar website was initially built in WordPress, the evolution from the inaugural startup to today’s mature and confident online experience was straight-forward and required minimal restructuring of existing content and function. Additionally, the team at Village Juicery can continue publishing content at their leisure, as almost all day-to-day management functions within the updated website remain the same. Parachute Design is located in Toronto Ontario and offers a wide range of services for startups including logo and package design, branding, and responsive website design. If you are interested in learning more about how Parachute Design can help your business enhance its online experience, or to have us prepare a proposal for your next website design project, complete our online quote request form, or call our branding and website design experts in Toronto at 416-901-8633.